Standing 25cm tall, each of these gorgeous soft toys has its own distinct appearance. Elmo has his chest and feet covered in ABC patches, whilst Cookie Monster has chocolate cookie patches instead! Each character is fully hand washable and is suitable for kids as young as 1 year old. The Gund company was created in the US in 1898 and is known all around the world for its iconic designs of top quality soft toys. Distributed in the UK by Enesco, their selections also include characters from the Peter Rabbit books as well as a massive range of huggable animal characters. 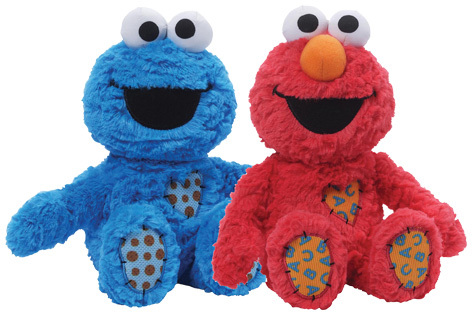 Please tell us what you think of Cookie Monster and Elmo by Enesco and Gund.